Cornelius Rogge is one of the foremost sculptors of the Netherlands. His work is to be found in the Dutch principal museums, cities and private collections. He received the prestigious David Roëll award of the Prince Bernhard Foundation and for his 45 years artistic achievement he was appointed Officer in the Order of Orange-Nassau. Below we shall feature photos of some of his objects and an introduction to some of his exhibitions. This season on the largest field in its sculpture garden the Kröller Müller National Museum shows six big tents by the Amsterdam sculptor Cornelius Rogge. They are made of heavy dark red brown canvas over a steel frame. Two tents have the form of a ziggurat: pyramidal with terrasses, two are conically shaped and two are truncated pyramids. The tour first mentioned tents are fastened to the ground by a forest of guy-ropes, the two other ones stand without such support. All terrasses of the largest pyramidal tent (6 m. high) are covered with sand. The conical tents are supported by black poles hidden in folds of the canvas, but sticking out on the upper side. The canvas of all tents is fastened to the ground with pegs. None of the tents have an entrance. From this description in many respects they seem to be normal tents, but the departures from the ordinary are also immediately clear. The unusual forms, the suggestive grouping, the guy-ropes that obviously have more than only technical significance, the sane and the fact that one cannot go inside. Against the background of a high wall of dark green rhododendrons the tents are clustered around some trees as a mysterious village, a bedouin camp, or a holy site with temples and graves and a shrine like the Kaaba. 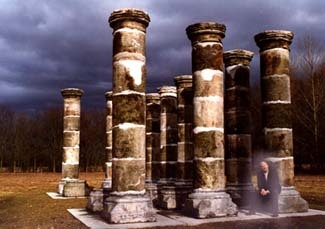 evoking precolumbian and oriental reminiscences. 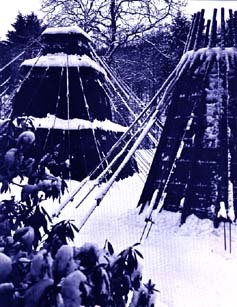 although the two conical tents seem to refer to indian tepees. At first sight the tents have a surprising but selfevident presence, however recognition soon leads to questions, associations and a confusing alienation. Rogge himself speaks soberly about his 'Tent-project' composed of 'tent-sculptures'. He sees those tents before all as a form of catering to the public, or as what he calls a 'vulgar offer'. He seems to accomodate the spectator by presenting his ideas in the common place outer form of a tent. Ostensibly, but the essence will not be revealed, the meaning can only become clear in time. An interpretation is neither expected nor desired, it would hamper any real experience in a pedestrian way. However, those who wish to follow the trail to the personal background of the artist may find a key that could possibly give access to the tents. It is not easy to really get acquainted with the work of Cornelius Rogge. For almost twenty years he has produced regularly and prolificaly, but every two or three years his conception underwent a basic change. Each time when he just seems to have conquered his real style the scene moves toward new forms and other materials. During each period thirty or fourty works come into being, good and bad, major works and less important approaches to the main theme. Rogge knows, but it has to be like that, each cycle has its run, it is an inevitable process of change, a continuous metamorphosis, constituting the essence of his creative potential. In the seventies the enclosures and constrictions obtain further dominance. The process of denaturalisation progresses towards new structures. What is really happening here? Where does it lead to in essence? This can only be understood if one has a certain inkling of the personal philosophy that directs the artist's vision and creative power. 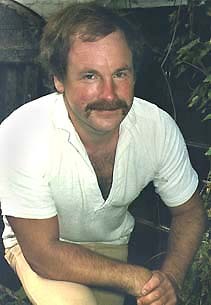 Rogge grew up in a theosophical family and theosophy still dominates his views of life and death. In his world death is life, death brings about life. All things are transient, vulnerable and must become decomposed to allow for a pass over into a new incarnation. What happens has been evoked by the forces of nature and man is to trifling to partake, but through isolation, enclosure and construction one can offer resistance, one can try to become conscious of the ways and means of nature's revelations. Rogge's own background is not only theosophical but also oriental. His youth was pervaded by stories about life in the former Dutch East Indies. In those two components one could find the basis for his unusually baroque sense of form and his want of mysticism and mystification. An urge to visualize the transcendental leads all his thinking and creating. In his work Rogge stands in almost flagrant contradiction to Dutch sculpture of his own generation that originated mostly from rather strict calvinistic traditions. He remains an introverted loner, who in his own words: 'sprung from the undefinable mud of art-historical limbo'. 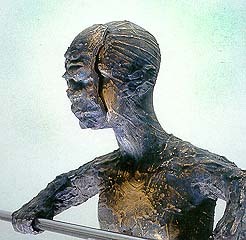 There is no real connection of Rogge's work with the Dutch art-scene in general or with the international world of modern sculpture. Nevertheless Rogge acknowledges a certain preference for the work of Eduardo Paolozzi and Daniel Spoerri. Paolozzi's absurdity and his Wittgensteinian way of thinking appeal to him and during the late sixties there was a moment of direct affinity in their use of softly curved forms, executed in chrome plated steel. A comparison with Spoerri's manipulations with tables seems rather obvious, but the idea of the 'Tableau piège' indicates the possibility of a deeper relationship. 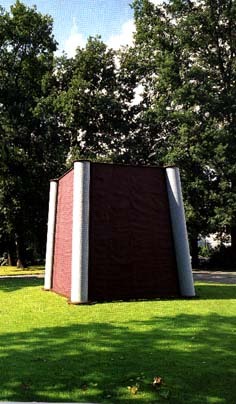 Strictly speaking each work by Rogge is a 'Sculpture piège'. Each work has its ambiguity, its 'double entendre': the trap of metaphysics. Rogge's 'Windows' and 'Grotto's' are sometimes reminiscent of the 'Teatrin' which Lucio Fontana made between 1964 and 1966. On that trail one can also go back to the Italian 'Pittura Metafisica', where the object is life in movement and also a magic revelation. a spectral presence, a reincarnation. Although his intentions are quite different Rogge's use of soft spineless objects also shows a formal relationship with the work of Claes Oldenburg. Rogge feels that he is one of those artists representing an individual mythology. He mentions the 1972-Documenta in this context and refers to Paul Thek and Panamarenko, but also to the alien world of Adolf Woelffi. The tents now stand in the sculpture garden as a testimony of growth, a gained consciousness. For the first time such an enlargement of scale was possible. As always, the tents also originated from a series, a cycle of more than thirty works, including soft constricted tables on meat hooks, hanging rucksacks and sagging tents without support. Those six tents show an only superficially 'vulgar' but essentially very complex 'offer'. Whoever takes the trouble to follow the trail back to Rogge's origins will still stay outside the real process. Apart from being a commonly used everyday term, metamorphosis is also a mythological term. In many myths and legends it refers to the continued survival of a creature in another form, as a symbol of the unbroken life cycle. At the same time it demonstrates the multiformity of the natural cycle, as expressed in the changing seasons, the phases of day and night and the stages from birth to death. Mortality, vulnerability and dissolution lead to rejuvenation and rebirth and as such are only the minuscule, ever recurring stages of life S cycle, the ever changing forms in which this unbroken process continues. The term metamorphosis could be used to describe the whole of Cornelius Rogge's oeuvre. The work that he has been producing now for some three decades has been subject to continual transformations. This seems to be a requisite observation - after all, every artist 's work develops in this sense - but in Rogge's case there is no question of there being a logical, linear development, of steps which, being based on previous work, contain an accumulation of knowledge and experience. From time to time Rogge unexpectedly shakes off his old garb and dons another. Therefore it's possible to describe his oeuvre as a series of groups of works with a related form. The moments of metamorphosis occur in silence, balancing between the certainty of the death of the old form and the uncertainty about the rebirth of a new one. This essential process can only be seen when viewing Rogge's work as a whole, or at least the greater part of it. As far as appearances go, in his case an individual work is no pars pro toto'. However, in its own unique way, each work is an expression of a highly personal situation in which, unaffected by developments in the 'surrounding' visual arts. the form's aho visions are supplied exclusively by Rogge's own interests and individual awareness. Intensified by Rogge's theosophical background, an important pillar in this is the realization of the subordinaton of the human being to existence, of the insignificant link that human beings form in the life cycle. After all, theosophy seeks the true nature of life, the soul essence, the divine, the mystery. Searching for the mystery in his own way, Cornelius Rogge has been moulding his personal mythology for years, creating and recreating it in ever new forms, which often cause the osberver to become confused and uncertain.Each succession of related works in Rogge's oeuvre arises from an abstract concept, moves towards a concrete phase as if to a sort of climax and finally turns back towards the conceptual and thereby more or less to the starting point. The concrete becomes the condition for the abstract. The essence of Rogge's work is represented in the form of concrete objects: tents, tables, windows, towers, wagons, as if the observer is being given a hand. Rogge himself speaks of 'vulgar offers'. However. this conceals a double meaning that needs to be seen. It's necessary to shift the attention from the material, the outer form of the objects, to the objects themselves. or rather, to the essential nature of what they represent. However, it's not easy to expose the layer of meaning behind the outward appearances because Rogge's mythology is not one of finished stories, there is no logical content to unfurl before the observer's eyes whilst following the series of works. We can only try to reach the essence through fragments. 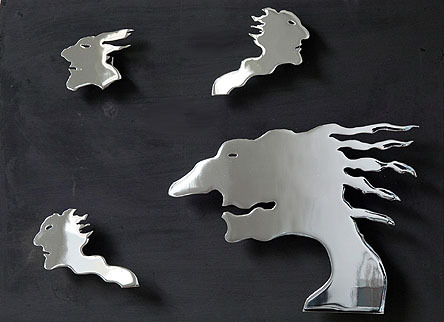 At the - not identical - exhibitions in Almere and Diepenheim, Cornelius Rogge exhibits wagons, swords, heads and masks. The wagons and swords were there first. The guy ropes of Rogge's earlier tents. the joists of the towers and tabernacles, became the spokes of wagon wheels. The closed covering has been removed; what remains is the open, exposed framework. Rogge's hermetic structures didn't surrender their innermost secrets, on the contrary, the wagons appear to have noth ing to hide. 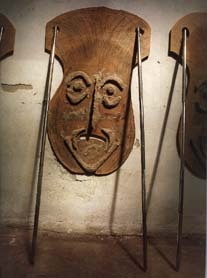 They display their loads in all openness: a large sword or a row of heads, both male and female. Yet when one attempts to approach and explain them, they appear to be unyielding. 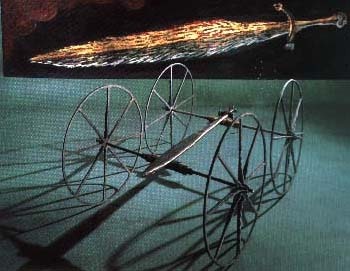 The wagons could have carried the swords to a battlefield. Whether, where and when this may have taken place, however, remains unclear, as does the possible destination of the human heads. No meetings occur, no battles, no reconciliations, we are only handed attributes rich in associations. The sword, so often the hero's attribute endowed with magical powers by the gods. is made anthropomorphic by Cornelius Rogge, at least it brings to mind a stylized, elongated body with a small head and short arms. Because of the way the artist has modelled it and cast it in iron, it takes on a certain - human - softness and is robbed of its aggressiveness. The hero and the sword melt together. After his heroic death, the myth leaves the hero to enter eternity, lying on his funeral bier, the sword laid lengthways on his corpse. Perhaps Rogge's wagons testify to another, intangible world. That of the dead? Later the wagons become lighter, finer, less substantial. The heavy, 'earthy' cast iron is replaced by the lighter, 'gleaming' cast aluminium. These wagons no longer carry swords. but heads of the same material, resting on a footboard made of wooden planks. At first the comparatively small heads seem to light a load for the enormous wagons. Cornelius Rogge refers to the heads as 'souls'. He hasn't given them the character of a portrait. but of an archetype, a female and a male on separate wagons. This character has a stimulating effect on the observer, who tends to see a direct relationship between the power of the archaic and the immanence of the transcendental, the higher, the divine. Rogge's heads are gripping and disconcerting because of their archaic form. We can't quite say why, and because of this they become even more the obvious resting place for the immortal. The heads are full of meaning and heavy in the figurative sense; their immaterial weight presses down on the appropriately large wagons. This immaterial load is expressed all the more strongly in a row of relief-like, almost two dimensional, practically identical heads, which are cut out of plywood, 'decorated' and finished with clay. The wagon wheels are replaced here with bars resting on the ground The heads are suspended from the bars by means of two holes in the plywood and are. as it were, pinned to the wall. The bars are those usually used by weightlifters. The weight that Rogge has them bear is once again of a totally different nature. The heads are like masks, waiting until they can take on their role in the coming ritual In principle the mask is a material object, skilfully made and finished. In the ritual, however. it ceases to be just a soulless object; it becomes the spirit or the power that it represents The mask is the perfect intermediary between human beings (who wear it) and the spiritual. The mask seems to be symbolic of the whole of Cornelius Rogge's oeuvre, summarized as a perpetual endeavour to approach that which can't be touched, which can't be penetrated. Therefore not only the work itself, the 'interpretation' too, every 'explanation' put forward to outflank unavoidably leads to the inexplicable. Each metamorphosis, each new form, in Rogge's mythology a vital necessity, fails to provide the observer with any new information. and only shows the riddle in a different guise. In searching for the essence of existence, Rogge's work is like existence itself: tangible in its outermost forms but essentially mysterious. The actual meaning is hidden in the mystery. Rogge is a primitivist. He is a primitivist not unlike the way that Paul Gauguin was. Gauguin searched for the essences of persons unfettered by civilization. For Gauguin, civilization corrupts the aborigine and tears him from the idyllic life. Rogge's art is also an art of essences. He hearkens back to the ancient Western histories to find those driving forces that endure in us. His Wagon with Sword recalls ancient Celtic society. These Celts were aggressive marauders who sustained themselves, in part, by looting and exploiting others. His delicate, fast wagon carries only the load of the killing and maiming implement. It is a blitzkrieg machine - beautiful in parsimony, but monstrous in its purpose. No modern viewer can help being moved by such images. "Aggressive marauders" who "loot and exploit" others might very well describe the countries and companies of the developed nations that raid non-industrialized nations for their resources and their labor. Human misery is the result. We could bring to these people medicine, education, longer lives, selfdetermination; but we bring them subsistence wages (or less). The exploited die prematurely, cast aside when they are used up by an economic and power-elite. This image points out the ongoing human contradiction. The well-ordered wagon with rich patinas reifies the sword. And what good ever came from a sword? This wagon depends on the sword for its very existence. The sword is the lynchpin that holds all of the parts together. By making the sword art and gorgeous metal with a lyric shape, it becomes as romanticized and beautiful as a recruiting poster. This objectified external contradiction is our internal contradiction. We who say we love peace are all too ready to fight and rationalize the fight. In fact, from Gericault to U.S.Army television commercials, war and the tools of war are made beautiful in order to maintain that ancient lie Dulce et decorum est pro patria mori (it is sweet and proper to die for one's country). Rogge's work reveals the tragic irony concocted by societies. Rijksmuseum Twenthe, Enschede: Special exhibition: '40 years objects of Cornelius Rogge', 1999. Reitsma, Monique: "Desintegratie en transformatie"
Exposition 'Turmoil of war' in the Army museum, Delft, 30th June up to 15th September 2005. 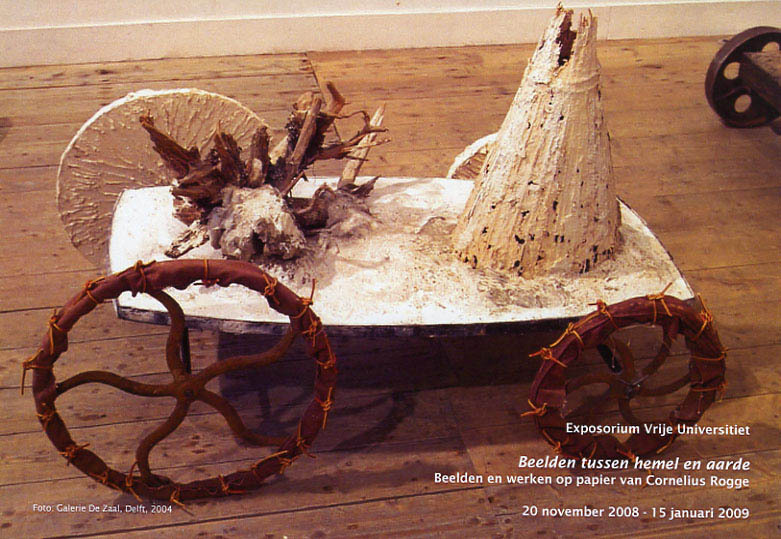 Exposition 'Zieleschepen' (Soul ships), Museum 'Beelden aan Zee'. June 20th till September 7th 2008.